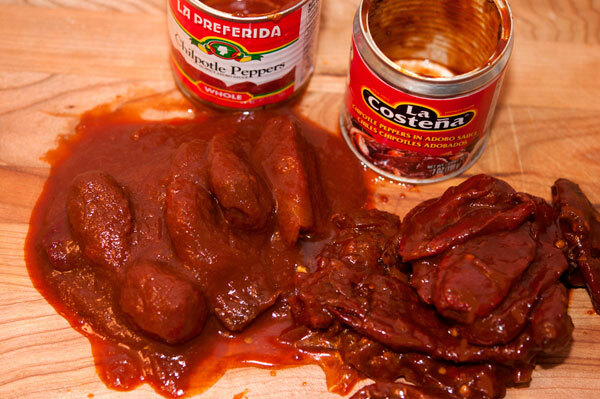 You are viewing the archive for the ‘Pork Kielbasa Sausages Fired Rice’ tag. I wanted to make an entire meal made of all pig meats after watching the TED talk by Christien Meindertsma. She is the author of the book “Pig 05049″, which discusses at least 185 non-pork pig products, from soaps to artificial hearts. I would call it – “The Pig Out Dinner”. I had also been meaning to invite a few friends for a dinner, but was not following through my intentions. During one happy hour, some of my friends suggested an impromptu party at my place. I took advantage of the opportunity to host the pig themed dinner. All of the invited friends were Nepali expats. I wanted to make the dinner in a style of a typical Nepali meal, but with non-traditional ingredients and using spices outside of the Indian subcontinent. The challenge was to make each dish consisting of pork from different parts of the world as well as to cook something that brings back memories of a typical meal from Nepal – dal, bhat and masu. For a signature drink, I made bacon-infused vodka. To make: add the left over bacon fat from cooking the bacon to vodka (or bourbon) in a mason jar, shake, let it stand, freeze it, remove the top hardened fat portion, filter the vodka through a paper coffee filters. The bacon flavor in the vodka was too strong. In order to reduce the total alcohol content and the bacony taste, I served the drink with twice the amount of chilled lime seltzer. The bacon vodka was not a hit. People stuck with the beers and wines they brought. It might have been a more successful if I had delivered the bacon vodka differently. Next time I plan to serve the bacon vodka in Bloody Mary – that should work. Simple, all I needed to do was buy them. 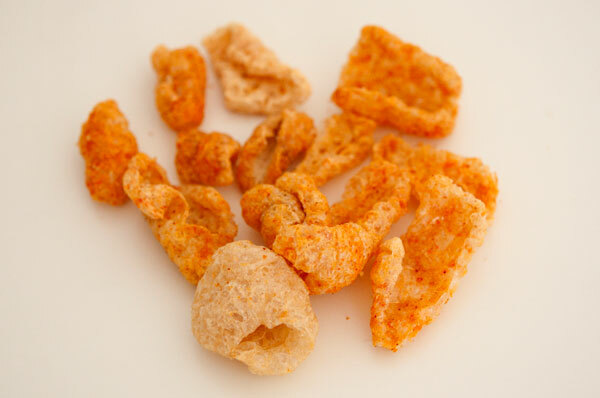 I served spicy and regular pork rind snacks from Utz. Again it was simple and tasty. Pork rinds are potato chips or cracker like snack, made by cooking and removing off most of the fat out of the pig’s rind. 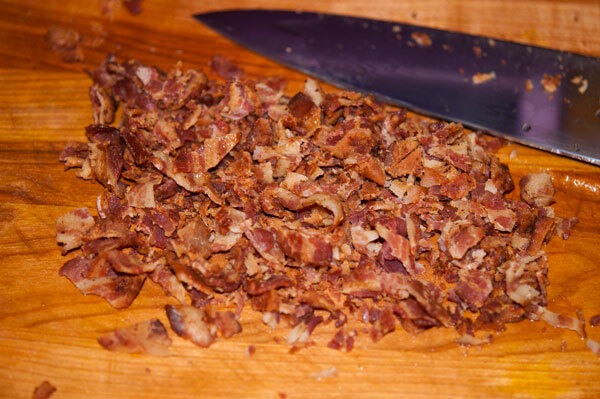 Bacon with chopped crispy bacon. I cooked the bacon the night before the party. I chopped the refrigerated bacon into small pieces and prepped guacamole by adding tomatoes and onions (see how not to brown guacamole). 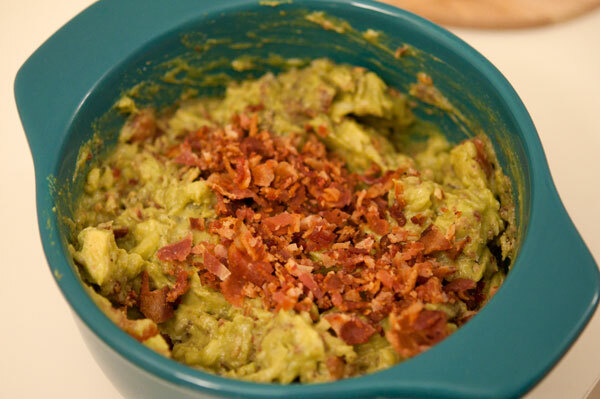 Just before guests arrived, I added most of the chopped bacon to the guacamole and mixed them. I used remaining chopped bacon as garnish on top. Even though, the guacamole was little toward the salty side, my guests still liked it. Note to self; add less salt if adding bacon. I served “a-typical” Nepali meal consisting of dal bhat masu. 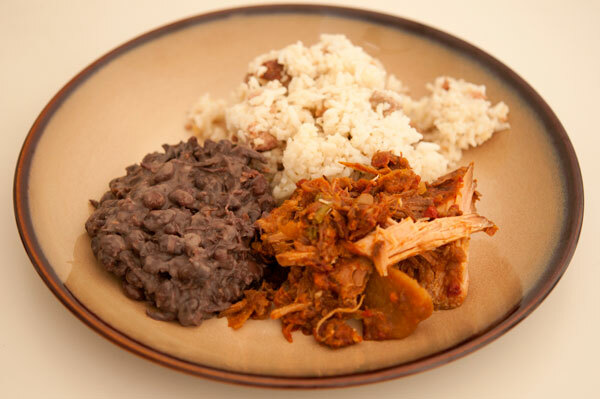 As the dal (lentils), I served black bean cooked with smoked pulled pork. I made the black beans from dried Goya beans. 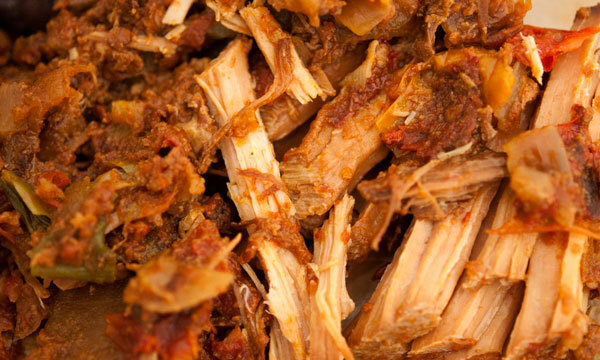 I used the similar techniques from as the last time I made black beans (see how to make black beans) except for adding smoky pulled pork. I made bhat (rice) with sliced pork kielbasa sausage. I added lime zest along with pinch of black pepper and salt for the flavor. Surprisingly, cooking the rice was the most difficult part because I was not used to making a large quantity of rice. For masu (meat), I made pork tenderloins slow cooked in a crock-pot for about 18-20 hours. 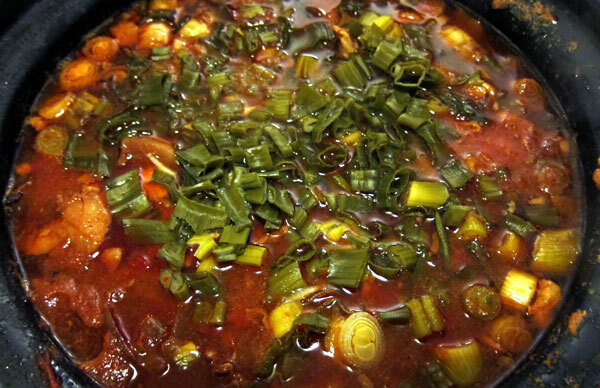 For 7.5 lb pork, I added 2 onions, 2 chopped bell peppers, 1 bunch or green onions, and 3 cans of chipotle abodo sauce. The 3 cans were a bit too much of heat. I should have stayed with the 2 cans as I initially planned. 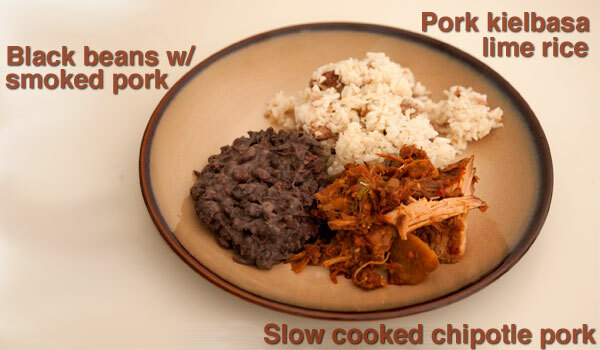 The pork dish was similar to chipotle chili verde I made half a year ago. For dessert I was planning on baking cookies with chocolate chips, bits of bacon, some bacon fat, and maple syrup. However, I ran out of time and energy. Instead, I served them store bought cookies. 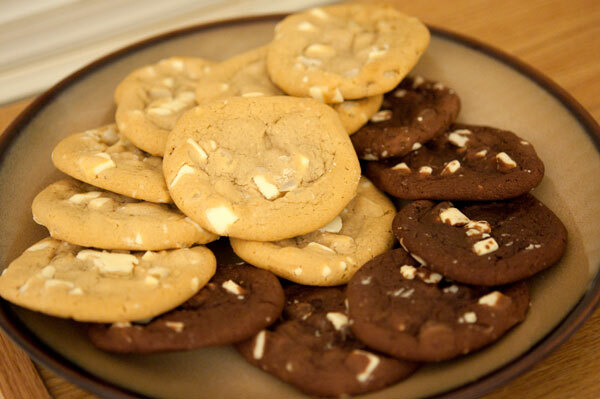 Making bacon cookies can be a separate pork related project sometime in the future – maybe all bacon dinner. Any takers?